Hydrogen is the lightest element we know. At the same time it has an extremely high energy density: one kilogramme of hydrogen contains about three times as much energy as one kilogramme of oil. High-energy, low-weight, zero-emission – that is what makes hydrogen so attractive to makers of electric vehicles. Hydrogen, chemical symbol “H”, is a colourless, odourless, tasteless gas. With an atomic weight of “1” it stands right at the top of the periodic table. Hydrogen has the lowest density of all elements and the simplest structure; its atom consists of only one proton and one electron. Hydrogen is the most abundant element in the universe and the main fuel of the stars, which fuse hydrogen into helium. On Earth hydrogen is only found in chemical compounds, i.e. as water (H2O), as part of organic compounds, i.e. all living things, and in hydrocarbons (natural oil, gas, coal, biomass, etc.). Energy can be used, however, to release hydrogen from a compound, making it an energy store. Hydrogen-powered vehicles are every bit as safe as conventional vehicles. 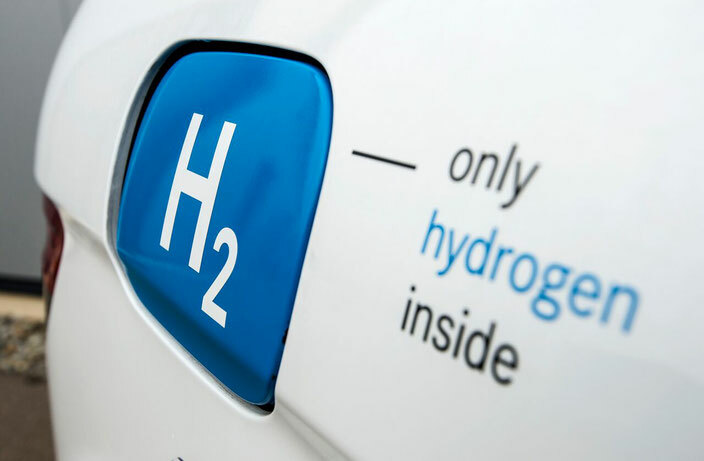 The technology and materials used in hydrogen vehicles and refuelling stations do, however, have to meet extremely stringent requirements, as demonstrated by a number of standards institutes including the German TÜV in various procedures and crash tests conducted with hydrogen vehicles. The high volatility of hydrogen is an advantage, since it dissipates, mixing rapidly with the ambient air and thus eliminating the hazard.